But that’s where Fed Up misfires. It takes aim at sugar as if it is the sole devil in the lunchroom. But scapegoating sugar removes the much-deserved blame from the avalanche of meat and dairy piling up on the center of our plates – and school lunch trays. No amount of sugar reduction is going to help if people are still going for the meat and dairy. A gram of sugar has only 4 calories. A gram of fat—from cheese, chicken, beef, or anywhere else has 9. Katie Couric’s new documentary Fed Up is an eye-opening experience for most Americans. 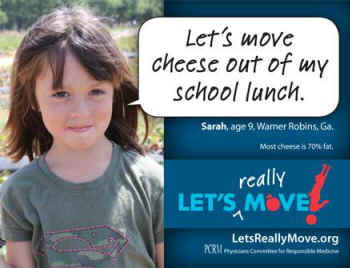 As the film shows, it’s nearly impossible to exercise your way out of eating pepperoni pizza, greasy fries, and a glass of low-fat chocolate milk—typical fare in K-12 school lunch rooms and family restaurant chains throughout the country. Exercise isn’t enough. We need to change what we’re eating. Compared with a century ago, Americans now eat 75 pounds more meat and 30 pounds more cheese per person, per year. In the last 30 years, consumption of cheese has tripled, fueling our childhood obesity epidemic. Meat and cheese are the fatty staples of the standard American diet. The same diet has a hold on the National School Lunch Program: The sugar industry spent $9 million dollars lobbying in 2013, compared to the combined $17.5 million from the meat, dairy, and poultry industries. Local beef burgers, pulled barbecue chicken, and turkey sausage need to come with parental permission slips. Countless research studies, including a recent study from the Harvard School of Public Health, show consumption of meat doubles diabetes risk. One in 3 children born in the year 2000 will develop diabetes at some point in their life. One in 5 now graduates high school with a diploma and high cholesterol, an early marker for heart disease, which remains the number one killer worldwide. While we work relentlessly to teach our students about strong work ethics, academic integrity, and kindness, I can’t say we offer the same when it comes to federal subsidies and nutrition education programs. The good news is leading medical organizations, including Kaiser Permanente, and political figures, such as former president Bill Clinton, are revolutionizing the way we think about diet and health. Science continues to show that when we make fruits, vegetables, whole grains, and legumes the center of our plates and remove the meat and dairy, our waistlines dwindle, our health rapidly improves, and our need for medication plummets. The Academy of Nutrition and Dietetics, the largest organization of nutrition experts, updated its 2009 position paper to say that well-planned vegetarian diets are appropriate for individuals during all stages of the lifecycle, including pregnancy, lactation, infancy, childhood, and adolescence. AND also finds people who follow vegetarian diets have a lower body mass index, lower risk of heart disease, lower cholesterol levels, lower blood pressure, and lower rates of overall cancer. Let’s really move plant-based foods to the center of our plates and see what happens.